I’m not certain why Esther Emery swore off the internet for a year. Part of it was because her life fell apart, and she needed a different way of being in the world. 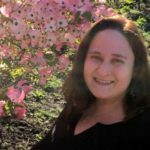 Part of it was an experiment for her audience; she announced her plans to readers of her blog, and in the early months sent updates to be posted online by a friend. She doesn’t write much about the evils of the medium—from privacy invasions to digital trolling— but those might have played a small role too. Mostly she was responding to a call of the soul that at the time even she didn’t understand. 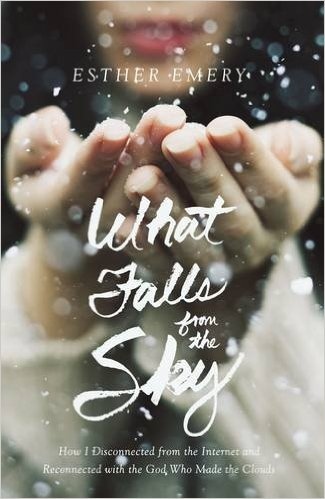 The memoir What Falls From the Sky opens just as Emery’s manic, overachieving life comes crashing down. She had found a sense of belonging in the theater as a teen that developed into professional satisfaction as an adult. She surrounded herself with glamorous, artistic people, and was critically lauded for her work as a theater director. But working in the theater also involved late nights, long hours, and intense relationships that led to some poor decisions. Emery’s celebrated career as a California theater director ended with a crash when she earned a new reputation for being an unreliable colleague. And things were going wrong with her marriage at the same time. Her husband, Nick Fouch, is the kind of guy who doesn’t speak much but can create almost anything through the wizardly work of his hands. He met Emery in college in their home state of Idaho, and later became a master set designer and builder in the same stage productions Emery directed. They were a power couple of the theater until infidelity on both sides led Emery to move out and Fouch to retain a divorce lawyer. In an effort to hold her imperiled marriage together, Emery moved across the country to Massachusetts for her husband’s new job and became a full-time homemaker for their two young children. Any one of these life changes would be traumatic, but to have them happen almost simultaneously would drive any woman to cast about for what she could control in her life. Hence the digital fast. Emery decided to live completely free from the internet for one year. She kept her laptop computer but disabled internet service, got rid of her cell phone, and, upon realizing that the chips inside bank cards are internet devices, put them away too. Instead of living a digital life, she nurtured a garden, met her neighbors, organized the family finances, and found her way back to church. Every facet of the story reinforces the theme of how Emery learns to forge connections from multiple layers of isolation. She discovers who her true friends are and strengthens some of her family ties when she can no longer email or text. Her divorce never proceeds, and slowly during her year without internet she begins to think in terms of “us” again. She evolves from someone desperate for the external validation of blog hits, YouTube views, and Facebook “likes” to someone who goes alone to a church that spiritually pulls her in from the street, to the back pew, to the baptismal font, to service in an impoverished village in Nicaragua. With a husband who’s an atheist and her own history of rejecting Christianity for its anti-feminist atrocities, Emery finds God in the silence left behind after the millions of chattering internet voices go quiet. I remember Esther Emery’s workshop at the Christian Feminism Today conference in St. Louis in 2014. Or rather, I remember the end of her workshop where she revealed that after their years in Massachusetts, Emery and Fouch moved their now-three young children back Idaho to live off-grid on a wooded mountainside, first in a tent, then in a yurt, and now in a small stick-built home. After her internet-free year, Emery re-embraced the internet with more wisdom but also more gusto. She currently maintains multiple YouTube vlog channels about her off-grid life, guest blogs for sites such as The Mudroom, writes for her own popular homesteading blog, and fends off Hollywood’s offers to star in a reality television show. This Idaho chapter of her story isn’t the focus of What Falls From the Sky, but the groundwork does get laid as Emery writes about grappling with her mother’s legacy. Esther’s mother, Carla Emery, was a minor celebrity in the 1970s. As the author of The Encyclopedia of Country Living, Carla taught a generation of leftist hippies and right-wing survivalists the homesteading skills they needed to live closer to the land. Esther and her siblings all had complicated relationships with Carla, in part because she spent much of her time as a single mother carting her children from one end of the country to the other selling her book at conferences and fairs, and displaying the children as props during television interviews. Much of Esther’s late teenage and adult life was a rejection of her mother’s values and lifestyle, but during her internet-free year, Esther found herself needing some of the very skills in her mother’s book. Today, Esther is herself a celebrity in the homesteading movement, a topic likely to be explored in the next book I hope she will write. I enthusiastically recommend What Falls From the Sky, and am proud that Esther Emery is one of our own CFT members. Her memoir is an honest, well-written story of what happens when one woman actually does what most of us have at one time or another dreamed of: powering down all the digital distractions to focus in a sustained way on the flesh-and-blood people in front of us and the Divine Spirit inside of us. Congratulations, Esther, on your book! I too enjoyed your workshop at the 2014 CFT conference. Thanks, Alena, for this interesting review. Will order the book tonight!